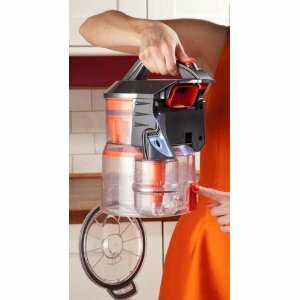 Lightweight Vacuum Cleaners – Why Bagless Vacuum Cleaners? If you are looking to purchase a new vacuum cleaner, chances are that you will end up with a bagless cleaner. Most of the major brands and models have done away with the need for a bag to collect the dust and debris from vacuuming. There are many advantages to a bagless system. First of all, there is the cost and convenience of not having to buy and replace the bag. Older vacuums and some current models still use a bag but they are not a universal size or fitting so ensuring that you buy the correct bag for your vacuum can be somewhat of a pain. Previously, some manufacturers devised a bagged system that was reusable. The bag could be opened at one end, emptied and resealed. So what is wrong with that system? One word sums it up: Suction! As a bag fills with dust, the vacuum is not able to draw as much air as an empty bag. This results in a lack of suction and more time and effort cleaning your home. This is where bagless vacuums really have the upper hand. They have a system that draws the dirt and dust directly in to a chamber that can easily be emptied and (usually) employ a cyclonic air system. This method eliminates the loss of suction as the canister fills. It also reduces the amount of dust that passes through to the filters in the vacuum. All of these factors help to keep the suction as powerful as possible throughout the cycle of filling and emptying the dust chamber. Another advantage that you may not have thought of is that the dust cylinder tends to be made of clear plastic. This allows you to know exactly when the vacuum needs to be emptied. Gone are the days of taking the bag out of the cleaner, giving it a bit of a shake and peering inside to try and see if you need to put a new bag on (it also means you won’t get a face and mouthful of dust). I would predict that it won’t be long until there are no bagged vacuums left in production as bagless is just more convenient, cleaner, more powerful and just make sense.